Millville, NJ. –Team Honda Research, with the support of Honda Performance Development, scored an impressive fifth-place finish during the weekend of August 28-29 at the first European-style Rallycross race in U.S. history. 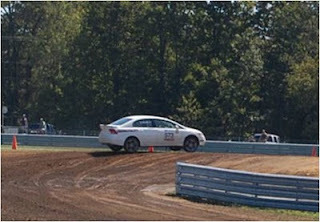 The race, held at New Jersey Motorsports Park, was the first round of the inaugural RallyCar U.S. Rallycross Championship. THR and HPD represented Honda in the Rally America-sanctioned event, with Brian Johnston driving a 2007 Honda Civic Si. RallyCar Rallycross events are based on the successful European Rallycross racing model, and feature cars racing side by side over a 1.3-mile mix of tarmac and dirt. Each lap features a jump, and each competitor is required to take a “Joker Lap” during the race, which adds a unique feature and time to that lap. The Qualifying and Heat races seed the top drivers into the Main races. All three rounds will be broadcast on ESPN2. After the poor qualifying result, the THR Civic Si started from third in the “B Main” group for the final event. Johnston got a good start and moved to second on the first lap. On the following lap, THR built enough of a gap to take the “Joker” lap and retain the second spot. When the first-place Nissan took the “Joker,” Johnston made the pass for the lead and never looked back, winning the race and advancing to the “A Main” race with the top six 2WD cars. The THR Civic Si ran a clean race in “A Main” and finished the event in fifth place. 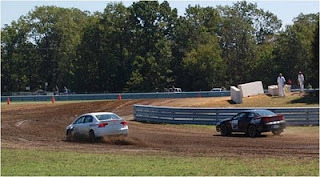 The team gets a month off between events, and THR, with the support of HPD, will be fielding an additional Civic Si at Rallycross Round 2, October 1-3 at New Jersey Motorsports Park, and at the season finale, November 5-7.